Is All Lalique Glassware Valued the Same Way? Many people don’t realize that René Lalique began his career as a jeweler in the late 1800s. He even designed for Cartier. It wasn't until around 1907 that he was commissioned to create his first glass perfume bottles for Coty. In 1910, he purchased a glass factory, and within a short time, he all but abandoned creating adornments as his focus shifted to designing tableware and artsy objects collectors most often associate with his name today. Because it was produced for such a short time, all of Lalique’s early jewelry is considered to be rare and quite valuable. An interesting fact about Lalique glass, however, is that it's not all valued equally. As Nicolas Dawes shared in an Antique Trader feature, the "devil is in the details" when it comes to determining the value of Lalique glass. Dawes, an Antiques Roadshow appraiser and vice president of Special Collections for Heritage Auctions, reports getting frequent emails stating that a party "saw one just like it" valued for great sums. But are those exceptionally pricey items really just alike? Unfortunately, the answer is probably not. For instance, Dawes cites R. Lalique decanters. A clear and frosted Six Tetes Carafe with gray patina dating to 1914 was documented as selling for $8,125 through Heritage Auctions. With a long neck and original patina, that piece is considered to be a rare example of early Lalique. At the same sale, a Wingen clear glass decanter sold for just $813. Made in 1926, this decanter was sold as table glass made for regular use. More of these examples not only existed, to begin with but survived over the years. So even though they are both Lalique, and similar in function, they are not exactly the same and won't be valued the same way. The condition also plays a key role in valuing Lalique. 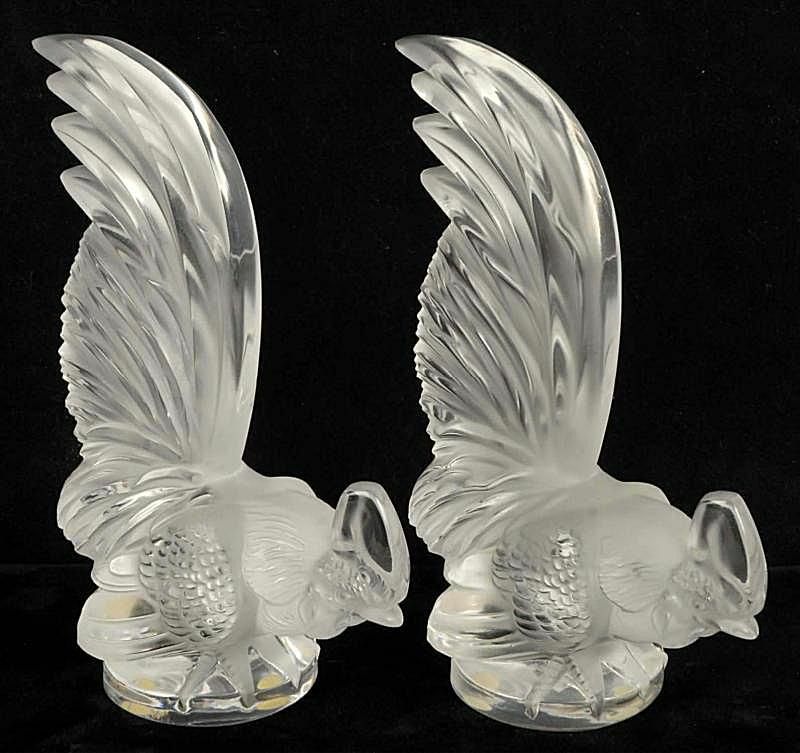 The pair of frosted crystal Lalique rooster paperweights shown above are both marked “Lalique France.” They measure 8 1/2" tall and are in excellent condition. The pair sold for $517.50 (not including buyer’s premium) at Morphy Auctions in January of 2011. It is not unusual for these exact paperweights, which are very nice but not considered rare, to sell in the $250-300 range per piece. If one of them was damaged in any way, it would be worth far less that one in excellent shape. Remember that comparing examples that look exactly alike is important when valuing Lalique glass, but looking at pieces in comparable condition is paramount. Shown above is an R. Lalique amethyst tinted glass 'Victoire,' also known as "Spirit of the Wind," automobile hood ornament described as an "important Art Deco design." It sold for $3,750 in 2010. Had it not had a small chip on the nose, it would have likely sold for quite a bit more. In fact, a car mascot like this one with the original Breves illuminating mount has been documented as selling for $21,250. The secret here is the mount, however, which is almost as rare as the glass itself. Without the mount, a similar ornament would sell for far less. In fact, one did indeed sell for $16,250 without the mount and no amethyst tinting (which occurs when the clear glass has prolonged sun exposure). And as illustrated above, even a small chip can cause the same object to be devalued even further. It’s safe to say most all Lalique glass in very good to excellent condition will bring a decent price in the secondary marketplace. But remember not to get too excited about finding a piece with this branding and the possibility of selling it for a small fortune until you know exactly what you have. Researching the exact piece you have and finding comparable pieces in the same or a very similar condition is paramount to accurately valuing Lalique. And you never know. One day you may come up with one of those real rarities that will sell for a formidable sum.